TRADITIONAL NEW ORLEANS JAZZ AND DIXIELAND OF TOP QUALITY! The band consists of five extraordinary jazz musicians who have played or continue to play in the most prestigious jazz orchestras in Prague. They are famous for their own style of interpretation jazz music of the 20s and 30s in the past century. 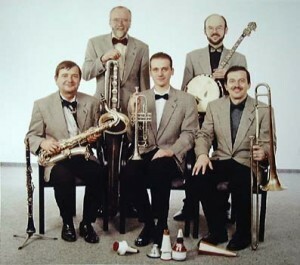 Their repertoire with diverse arrangements comprises a wide musical spectrum, from the already mentioned New Orleans jazz and Dixieland, to dance music of the 20s. With their perfect arrangements they are able to reproduce the acoustical characte- ristics of the one-time instruments. The choice of instruments - trumpet, clarinet /C-melody saxophone, trombone, banjo and unique bass saxophone quarantines this orchestra an individual and unique sound. The arrangements and the musicians' solos bring back the golden age of jazz, film art, automobiles and planes in the Western Hemisphere. does not require a piano or percussion instrument to create magic - therefore it does not need much space. This makes it even more attractive for organizers of social events or celebrations. play pure music - a joy for connoisseurs and music lovers at jazz concerts and balls alike.